Learning a little about marriage, travel, living primal, photography and career life. We are newly moved to Switzerland for work, and are currently documenting our wedding trip to Ireland. 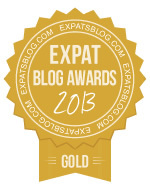 ExpatsBlog.com Expat Blog Awards 2013: Switzerland Gold Award! Amazing blog! Can't wait to read more about your travels in Switzerland. LOVE this blog! It is an amazing story with fantastic photos!!! When you read it you feel like you're following along with a live story, and quite the life adventure. Love reading about their travels. They have such stunning photos and great stories. Real memories to last a lifetime! And I'm also really enjoying the recipe/food posts. More of those please! Great blog! Love the pics. Can't wait for more. Enjoying this blog. Great photos. This blog is an absolute must read! I love everything about it. From the writing to the amazing photographs, I will be a long time follower of these two. This journey is well written with amazing photographs. I am so glad to be along for the ride. Great blog!! Loving the adventures and amazing pictures! Fantastic blogging!! Feel like I am seeing the world!! I love finding blogs that give you ideas for travel! These two give you the details you need if you go yourself. Thank you expatsblog for featuring these two. Can't wait to see where they go next.